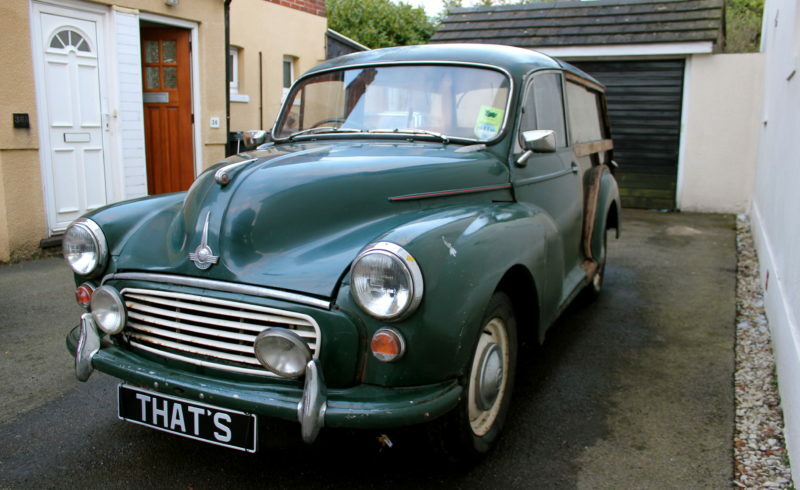 Here we have a Morris Minor Traveller from 1963, It has been garaged for the majority of its life. It comes with lots of service history and previous receipts of restoration work carried out. It has had a reconditioned engine fitted a few years ago and hasn’t covered many miles since. New gearbox fitted in 2008 at the cost of £250 and many other new parts. The wood needs sanding and re staining and the wood by the sills may need replacing too. Passenger side has been sanded down and will require further work. The hand brake works but the brakes do not. New brake lines have been fitted at the front as well as other new parts but the brakes haven’t been bled. The main part that needs to be addressed to get an mot will be the welding on the rear sills and the front brakes need work. It is a restoration project. The engine runs very well and starts a one turn of the key and will drive backwards and forwards and selects gears no problem.